Almost sixty-five years ago to the day, 60,000 Marines landed on the island of Okinawa, meeting little to no opposition from the entrenched Japanese and Okinawan forces. The three-month battle which ensued to claim the island, however, would be one of the bloodiest in the Pacific theater. In anticipation of fierce resistance to an amphibious landing, the US Marine Corps made careful analysis of the topography, soil conditions, and potential landing sites. 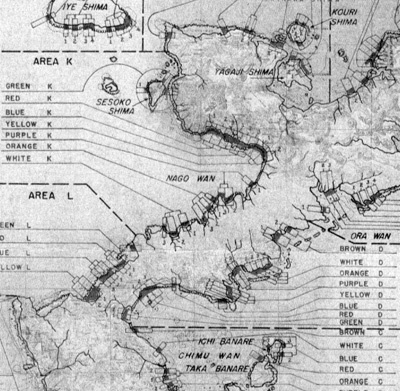 The island's perimeter was delineated into "areas" labelled from A to Z. These areas were further sliced into sections with colors: green or black is always on the extreme port-side and white or brown on the starboard-side of the area. On beaches which needed even finer resolution, such as the Western Beaches where the Marines eventually landed, the colored sections would be further sliced up into numbers. These maps were a significant undertaking; they were prepared nearly three months before the invasion was to begin. When I visited the island last April, it was curious to find some of the installations named "White Beach" or "Blue Beach". Only later did I find out that this nomenclature of the invasion persisted and leaves its residue on the island today. I admire the seeming simplicity of this kind of analysis which encompasses both complex and speculative information. How can architects make use of a military way of thinking, considering the project site as an infinitely divisible entity? Taking that a step further, the way that a site is divided should be a large part of the design process. Site analysis is not something that is done and finished before the design begins but is continually re-written and re-worked as a design progresses. The military might just call this adaptation--the ability to change a plan based on information received after you hit the ground. After all, how do you know how much of a 'site' you want to analyze when you haven't designed anything yet? Architects work inside of property lines, but those arbitrary lines hardly define the site. Consider the trend this past decade to look at networks, infrastructure, and the like: we are rapidly expanding and questioning the notion of site. Landscape urbanism, with its processes of mapping and diagramming, is in my opinion just another way to slice up and draw attention to the question of situating a project. The site is defined by architect's own (frequently) arbitrary will. Where does the site begin and where (if ever) does it end? A thesis might have little to do with site, or it may be entirely bound up within this notion of site selection and site definition. 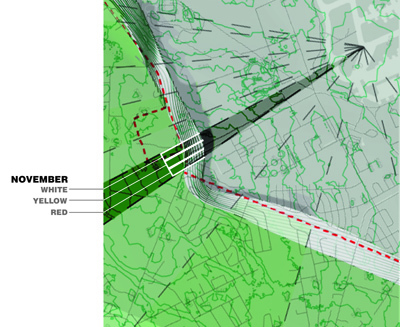 In my thesis, site is the genesis of the project. It begins with a ground zero, a null point on the map. It begins at the moment when an F-35 turns on the engines at the foot of the runway--the architecture of135 decibels. A wall is raised to attenuate the sound for the community without, yet to leave it as just a wall would neglect a latent opportunity. 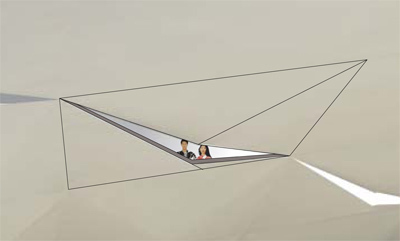 To occupy the jet noise barrier produces a new kind of interaction between the military and civilian worlds. Choosing the thesis site as the edges of military bases on Guam is deliberately slicing the island at its most complex, contentious line of fracture. 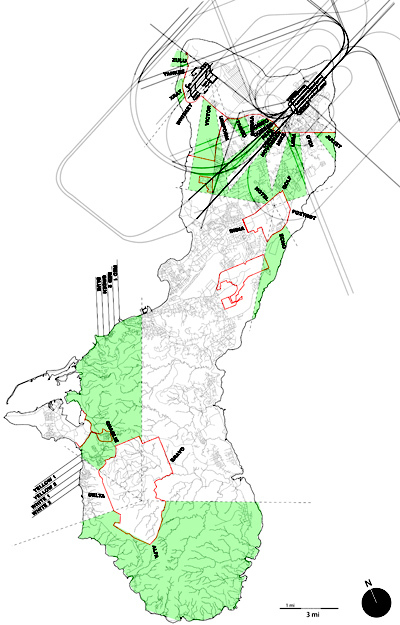 There is a political condition of military bases and how they intersect/overlap with the civilian context (e.g. the attempt to acquire 2200 acres of civilian land for the current buildup). 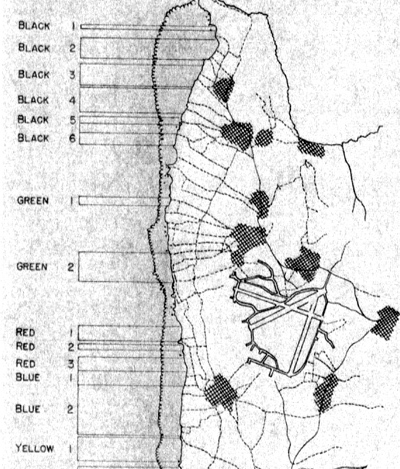 There is an ecological condition of a landscape altered by military presence. And most importantly, there is the export of jet noise when the F-35 is based on Guam. In theory, the entire island could be subdivided with high resolution. 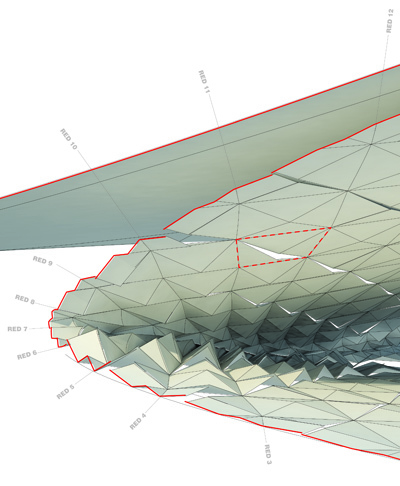 The purpose would be to quantify the effects of environmental noise and develop specific architectural responses to that noise. In this case, a fissure in the noise-scattering surface produces a touristic opportunity: tourists will flock to the island to go "bird-watching"--that is, to observe US Air Force jets in action. Built into this noise barrier, these boutique hotels will produce jet noise experiences: a health spa, a variety of resonance chambers, and a clinic for sonically removing gall bladder stones. Just as mapping the city as an amalgam of watersheds redefines the way we see the city, so too would mapping the soundscape. How sound travels, with its own particular physics, might radically alter the way we think of landscapes and cities. Vegetation and landcover, for example, could be mapped solely for their sound absorptive properties. Given this line of thinking can we propose that property lines as we have drawn them become meaningless? I suggest that in the future we will define property by stratified air, not by lines in the ground. And speaking of property, consider why we have so much litigation over the issue of sound propagation. Often sound propagation is misunderstood in the design process. I think part of it is because designers treat it only as a nuisance, as a subnature. Designers spurn noise, and so it comes back in the form of lawsuits. But there is also a disjunction between planimetric surveying and atmospheric conditions such as noise. How then does noise alter how we define 'site'? As I aimed to do in my desert experiments, I'd like to come to more clear terms with a definition of noise and experiment with our perception of it.